From Viarco of Portugal, pencil talk is pleased to present an amazing new limited edition pencil collection. Further, we are privileged to feature an interview with Viarco’s José Vieira. 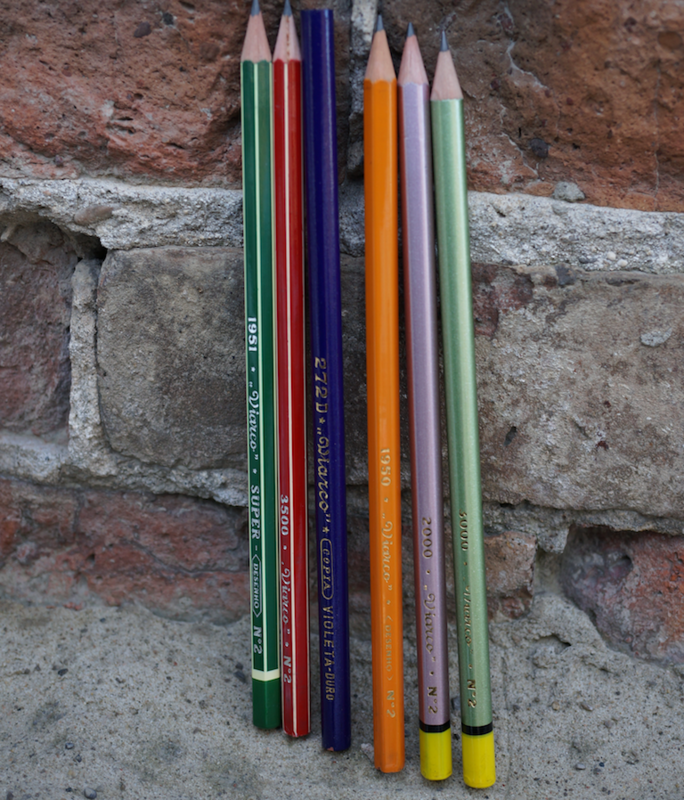 The set was a surprise to me – six historical recreations of pencils and packaging, offered as a set. I’m not sure where the set is being offered – I found it at a US retailer, but not on Viarco’s website. The six pencil boxes are housed in a black cardboard presentation box, so the set has 72 (a half gross) pencils in total, similar to many vintage boxes we’ve seen over the years. This limited edition collection is wholly designed in Portugal using long-established production methods. 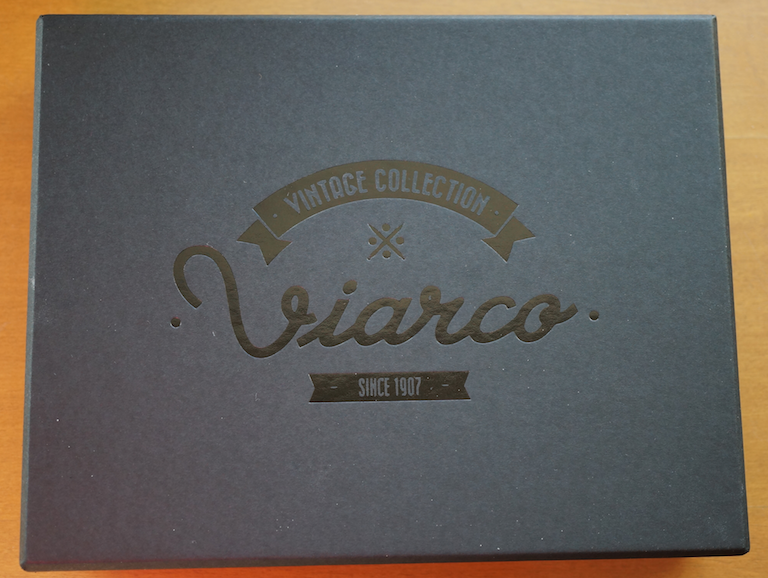 The box itself is matte black with a simple glossy graphic – “Vintage Collection Viarco Since 1907”. 1. The 1951 Super Desenho – these are beautiful hexagonal pencils in green, purple, red, black, purple, and marigold, with white pinstripes. The marigold is the only one to feature a contrasting cap – yellow. The box is sliding, and blue. 2. The 3500, red hexagonal with white pinstripes. These have unfinished caps. They have a red sliding box. 3. The 1950 Desenho is yellow, uncapped, and hexagonal. The box is green with a folding closure. Now we get to the second row! These are the only unsharpened pencils. They come in a colorful green/grey sliding box. 5. 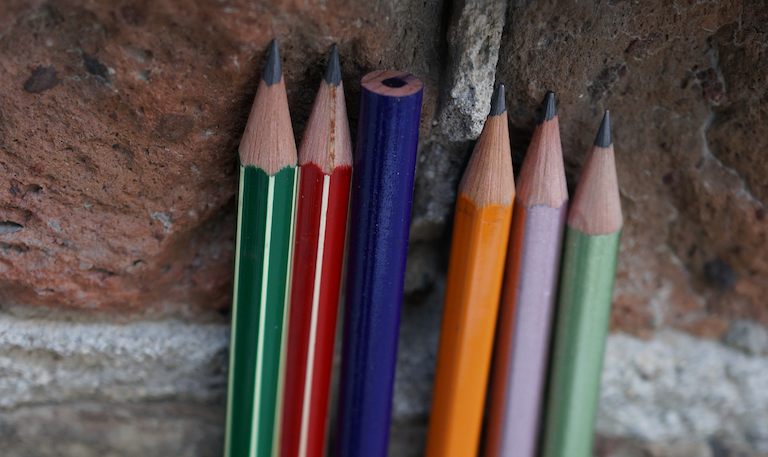 The 3000 – a round light metallic finished pencil in violet, turqoise, pink, red, yellow, and green. They have a yellow finished cap. The box is grey slider. 6. The 5000 – basically, an hexagonal version of the 3000. An orange sliding box houses the pencils. The box also has an insert (Portuguese/English) discussing the set. I love that there is a variety of pencil types, of packaging, of graphics, and with beautiful typefaces and historical themes. This post has a special treat. A decade ago, online commerce was not as advanced, and this blog may have been Viarco’s first online customer. It was done in a way that would be hard to imagine now – back and forth correspondence, a bank draft, frequent communication. I was very impressed at what this company were willing to do for a single overseas customer. The best aspect of this is that I’ve been able to keep in touch with Viarco over the years – and in particular with José Vieira, whose title is General Manager of Viarco – Fábrica Portuguesa de Lápis, though he likes to think of himself as just a pencil worker. Viarco was founded in 1907, but found itself in financial trouble in 2011. José started working there in 1999, and is the fourth generation of his family to work at Viarco. In 2011 he and his wife Ana bought Viarco to ensure the company’s continuance. Here are a few questions for José. 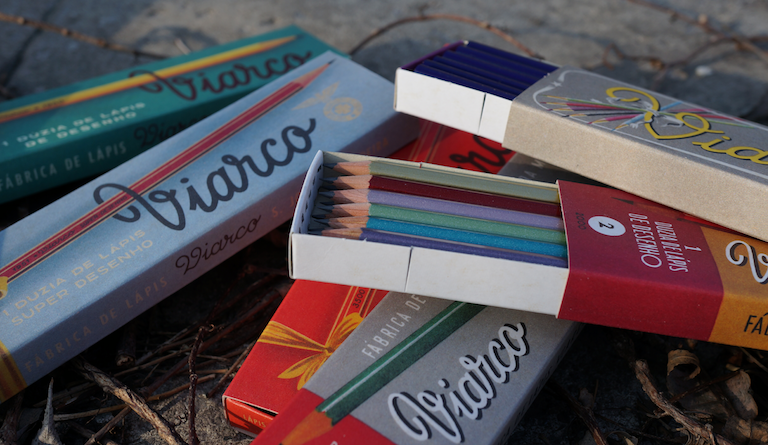 pencil talk: What was the inspiration for the Viarco Vintage Collection? José: The existence of original pencils and packaging, and the opportunity to make them again. We have a friend that is a designer, and he chose Viarco to make a study of the design inside a PhD that he is doing in the university. As you know we started to use some vintage packaging ten years ago, at first to sell them in Portugal where there exists a generation which has affection for them; now we would like to know if they could exist just by themselves in other countries and cultures outside of Portugal. I think you know that Viarco produces several innovative materials and that we are very, very, very interested in what it can be in the future, but our roots are in the pencil factory. The project is to keep this ancient industrial installation working. So it’s not a retro trend, it’s not a commercial goal, not even an academic project but once again the result of several people with different interests and needs working together to keep the knowledge and the memories available for those who like to dream of a different kind of society. pencil talk: How were the six varieties in the set chosen? Are there other pencils you regret that you were unable to feature? José: We chose those six because they represent a coherent language of a time period when Portugal was closed to the outside world due to the dictatorship and for that reason something that could be an authentic example of Portuguese design. And of course because they work well as a set. There are several packaging types that would like to make again … Some of them we tried, but unfortunately there is a no one able to make the boxes, or we have already lost the tools to produce the pencil. There are some limitations about what we can do and what our suppliers are able to produce. In the past when everything was done manually, and the cost of this kind of labour wasn’t a problem, they could make things that now seem impossible to reproduce, companies don’t know how to do it, don’t have a commercial interest in it, or even because it’s too expensive and for that reason unaffordable for this kind of material. 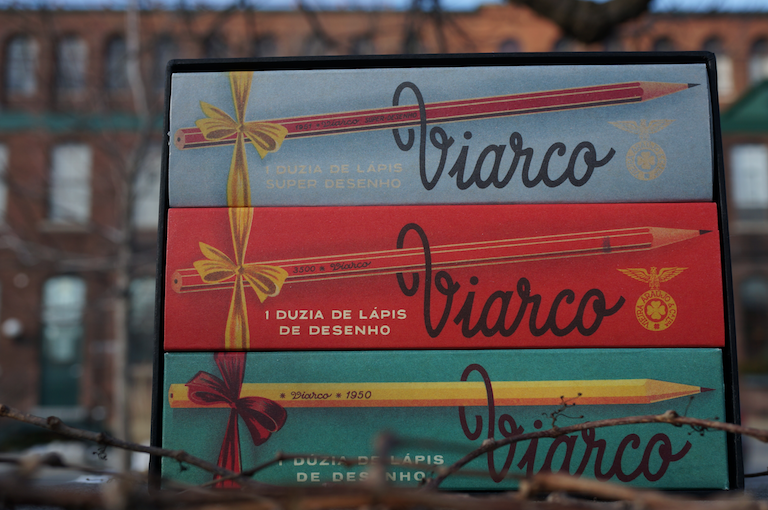 pencil talk: The Vintage Collection is not the first nostalgic or historically packaged item from Viarco. Is it correct that the modern Viarco has a special relationship with the company’s heritage? José: … Answer nº1, plus as I told you before we are much more interested in the future than in the past, however here in the factory everything is from the past except the mindset of the people that work here and the people that we receive. So its quite natural that the heritage influences everything that we do, and we try to respect it every time that we develop new products and packaging because this is a important part of our identity and authenticity. pencil talk: What pencil is on your desk right now? During the different processes of the pencil production all the damaged pencils start to being separated. Normally I take one or two of those to sharpen and try to see what happened. So in my desk normally I have damaged pencils that, from time to time, I need to send the endless drawer because some are so nice that I want to keep them for future memory. My sincere thanks to José Vieira for his great generosity in taking the time to answer these questions. It was tremendously enjoyable to learn about his passion for Viarco. The outdoor photos were taken in front of the Toronto Carpet Factory and the former Central Prison Paint Shop, 19th century buildings in Toronto. Thanks for such an informative post about Viarco; even with the Internet today there are pockets of the pencil world that are still difficult to reach. Thank you for these details! The box is beautiful. – Viarco is an amazing and impressive company. I was fortunate to meet José on the Paperworld trade show a few times, and it was a great pleasure! Thank you for your comments. Let’s all keep an eye on this exciting company. The interview is really interesting, thank you! Someone from the Erasable Facebook group who lives in Lisbon was trying to figure out why he couldn’t find these pencils anywhere inside Portugal — he ended up emailing Viarco, and they told him their first batch went directly to South Korea, the second batch went to other business abroad (of which Pencils.com and CW Pencils seemed to be part) and now they’re in the process of distributing them to “Vida Portuguese,” a high-end stationery boutique in Portugal. Thanks, Andy! I really enjoyed José’s answer to my question about what pencil was on his desk. It wasn’t what I was expecting! And thank you for this information – it reveals some important facts regarding the limited availability. Thank you for showing this beautiful edition. It is a shame that Viarco never managed to establish a presence outside Portugal that makes it easy for people to buy them in brick and mortar shops where most of the business is happening. Thank you for the comment, Matthias. Viarco is a relatively small company, so the lack of international presence is expected. It does seem to be changing!